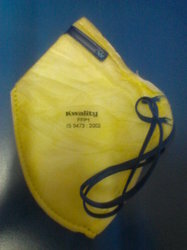 Supplier & Manufacturer of Respiratory Dust Mask. Our product range also comprises of Shoe Cover, Hospital Cap and Surgical Mask. We are specialized in offering Respiratory Dust Mask. Our offered mask is developed from quality assured fabrics thus making these durable in nature. We offer the nose protection mask in varied sizes to suit the demands of clients. It is highly appreciated among our clients, owing to its filter capacity to protect from environmental pollution. Looking for Respiratory Dust Mask ?